I’ve managed to get my hands on some Filmindia magazines from 1946. Naturally I will share the juiciest items from Baburao Patels’s witty pen, but right now I am just loving the beautiful color plates of these lovely actresses. I think this might be the same Rajrani who went on to have a long although unsung career playing sisters and mothers lurking in the background. I have still not managed to pinpoint her although I see her name in credits a lot. Of course, she could also be a completely different Rajrani! Or Raj Rani as the case may be. Here is Dulari before she too became a standard Ma and Dadi Ma. Love the jewels in this one, love. Do not think I have ever seen Khurshid (Junior) in anything though. Have you? There seem to be several Khurshids too. More delights shall be forthcoming! Posted on September 9, 2010 at 9:13 am in Baburao Patel's Poisonous Pen, Hindi movies	| RSS feed You can skip to the end and leave a reply. Are those photographs or have they been retouched in some way? A pox upon your clarity, modern photography!!! I think they are photographs which have been hand-colored…sometimes the hand is a little heavier than others :) I love them…if I were better at black and white photography I’d give it a try myself! Photo studios used to do a lot of this colouring, even for family photos. Love it. Awesome! I found Khurshid mentioned in a lot of issues of FilmIndia shared by you. She’s the main Khurshid—she emigrated to Pakistan after Partition I think. She is probably the reason this one is called Junior :D Nice article, thanks for sharing! Shyama was a Khurshid too — Baby Khurshid when she was just starting out. Guru Dutt changed her name to Shyama because there were “too many Khurshids”. Hey Memsaab this is great. Did not know Dulari looked so glamorous in her younger days. She worked with dad in many films. I think she was married to a make-up artist. She was really pretty in the dreadful film Jeevan Jyoti with Shammi (she played his sister). Wouldn’t it be so useful to be married to a makeup artist? Or a really good hairdresser? Although it’s a little ironic for her, because she was frumped up fairly early on. She was often seen either as a poor woman or as a household help. I found her to be quite a natural actor onscreen, she never overacted. Love the photos Greta! Thanks for sharing!! Never seen Dulari like this. She’s not dressed in a sari, she’s got lipstick on (though that could have been colored later). She looks a bit like a Jaya Bhaduri-Bindu combo to me but that could be because of the hairstyle. Never heard of Khursheed Jr. For that matter, have never heard of Khursheed Sr, either. All the more reason to watch more movies of the 1930s/40s. Anyway Khursheed Jr. looks like a Reena Roy-Meena Kumari combo to me. And Raj Rani has shades of Lalita Pawar about her looks. The prints on the kameez she is wearing reminds me of the 1960s/early 70s. It is such a pity that movies were only in B/W in those days! Can you imagine how different actors would have looked if there’d been color then. I guess these shots are an indication. (Though some movies are best seen in B/W). Thanks for sharing these pics, memsaab. Looking forward to more 1946 stuff (pics and stories). I forgot to talk about Naseem. She was just so beautiful. You can clearly see where Saira got her beauty from. I think Naseem is much more beautiful than Saira, although Saira is no slouch in the looks department either. I agree with you Naseem is more beautiful. On the other hand, almost certainly not. These guys can barely manage to do what they’re supposed to; not even that. Why should they go out of their way to do something extra? Greta, very pretty indeed. :-) Thank you! And definitely more effort needs to be put into restoring the black and white versions before even *thinking* about colorizing them! Well, they coloured Naya Daur, and Mughul-e-Azam. And they followed this style. There were a lot of purists who didn’t like the coloured versions. I on the other hand love gaudy stuff. Oh, but of course, Fiends didn’t do it. :) In their hands, the films would be mud. LOL! “Mud” sums up most of fIENDS products nicely. Guru Dutt’s films though should NOT be colorized. Ever. That would be All Kinds of Wrong. Aakhri Khat neither. And some of Dev Anand’s 50s films. I love 30s/40s style, always have. So chic! Lovely! I love the unmistakable look of these “colored” B&W photos. My Bollywood DVD viewing only goes back as far as 1949. So, it’s neat to see these. I would love to see earlier films, but the DVDs seem harder to find… or I’m just not looking the right place, or don’t know enough of the “older” stars to look up their film history. In Pukar and especially in Nausherwan-e-adil Naseem’s voice is so much like Saira’s (the other way round really). I agree with Raja about the Reena Roy + Meena Kumari looks of this Kursheed. It’s quite strong. The Bindu (more) and Jaya combo of Dulari is also there though to a lesser extent than the Kursheed one. Wow!! Excellent pics. Dulari was best seen in “Shehnai” dancing with Mehmood,s father in the famous song “Sunday ke Sunday”. Khurshid Jr. is NOT the same as the famous Khurshid of “Tansen”. 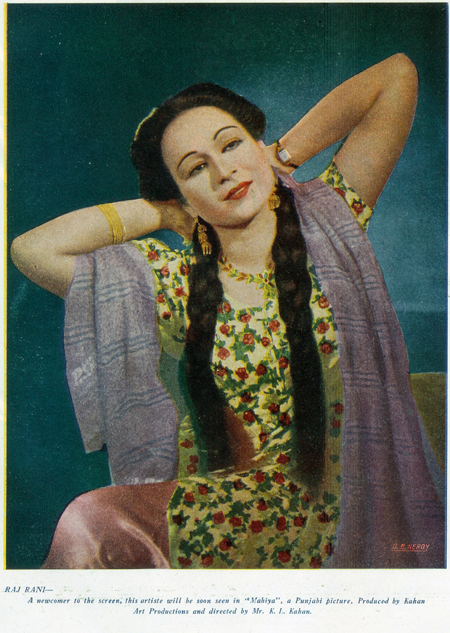 She came in 3-4 films around the era of partition 1946-48 and mainly acted in films of Ranjit Studios. None of these films survived the box office or the studio fires! Waiting to see more pics…. Naseem has those lovely wonder filled eyes that were passed onto Saira & this ‘Raj Rani’ looks very familiar, yet I cant recall ever watching any of her movies…could she just be a dancer or extra?? I too echo “Lovely”. Thanks! Gorgeous pics and lovely ladies. I love how each one’s “look” is so distinct…so much better than glamour shots. Great pictures memsaab! Thanks for sharing. By the way Naseem had tough competition in the looks department. That she was called “Pari Chehra” amply demonstrates her position. Dulari was a surprise. I have felt that some actors have always played the character roles of moms and dad in the movies. Dulari was one of them. Even Leela Misra falls in the same category. Nazir Hussain, Om Prakash and David are the other actors in this category. Dulari was very pretty but she never made it as a heroine and so fell quickly into secondary dowdy status :) Agree with you on the others—they are perennially old even when they were young! Wowww…Wasn’t Naseem Banu ethereally beautiful!! Does she still have them?! I suppose that would be too much to ask…I would love to see them if she does, though! I do want to make sure I scan these and keep them because they are works of art in themselves :) The magazines won’t last forever either. Yes.. she does have some of the pics… have already asked her to get it out of her closet…;). Next time I meet her will get them and scan them… and send them to u…sure!!! Sure… she wont mind… actually she is not even aware how priceless they r for ppl like us… ;) As soon as I get them from her, will scan them and send them to u so that you can share them!! Very nice pics. Yes, Naseem Banu was very pretty. I have seen “the main” Khurshid in lots of clips (though as you know, finding full movies with subs and everything from that era is another matter :) ), but I didn’t know anything about a Khurshid Jr. The only other Khurshid I know about is Khurshid Anwar, the excellent music director whose films included two of my favorite singing stars, who actually happened to be together in a Mehboob/Naushad movie in 1946. This post and the ladies in it – ‘ati sundar’! @Greta – Find it difficult to digest that the magazine didn’t have pics of Shobhana Samarth in this issue. Thanks Memsaab, for these pics! They indeed bring on bitter-sweet nostalgia. I hope the Indian movie industries (Hindi and other regional) would establish and fund an archival project. As much they relish self-referetial dialogs in the new films, they seem short on long-term memory. Maybe there are other sites for such things but I thought you and the visitors here might enjoy the colored pics at the bottom of the page. Naseem looks a lot like the silent film actress Lillian Gish in her photo. She has been posed with a similar winsome expression. Thanks for posting the rare pictures of 40s film stars. 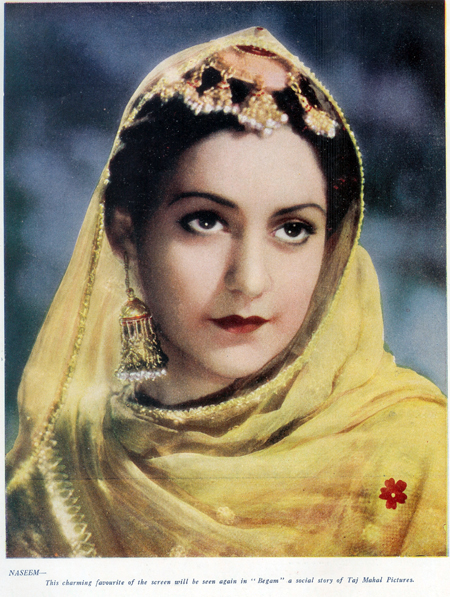 If you can… can you please trace a picture of popular Bollywood filmstar of the 30s – Miss Bibbo. Miss Bibbo migrated to Pakistan and worked in few films as character actress, I would love to see her how she looked when she was young. It is said that she was the only film actress of that time (1930’s) whose clothes and shoes were studded with expensive stones. She also holds the distinction of being the first female music director of Bollywood. Naseem Bano is pretty, but I don’t know if you guyz will agree with me or not, her acting is really annoying and theatrical. I have seen her in Anokhi Ada, and she keeps on shaking her head… lol! and it gets really annoying after a while..
Khursheed Jnr was Meena Kumari’s older sister. Really? How many sisters did she have? And I’ve been meaning to come back here to mention that I learned of another Khursheed or Khurshid (though maybe other people here knew already). 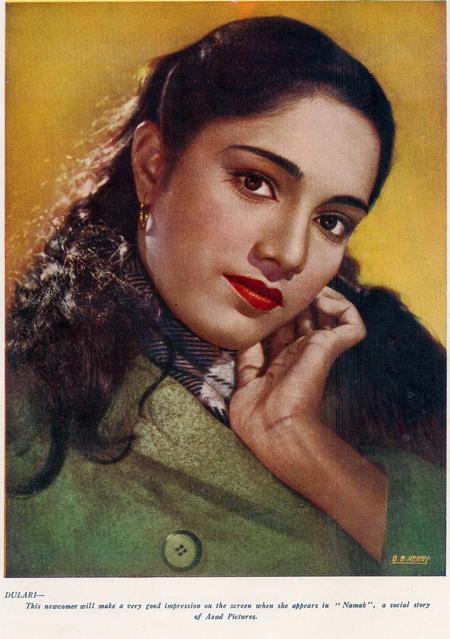 There was the young actress billed Baby Khurshid, who appeared in mid-’40s movies such as Zeenat. It was interesting to learn that Baby Khurshid was Shyama! thx for sharing all the pics & info about yesteryear actors &actressess…yep Naseem was good looking she was wooden in acting dept.. I am deeply involved in study of early Indian cinema, since inception in 1913 to 1950. I have collected a lot of information, and I’d like to collect more. Many thanks for such beautiful pictures of our magnificent ancestors, to whom we owe a lot. 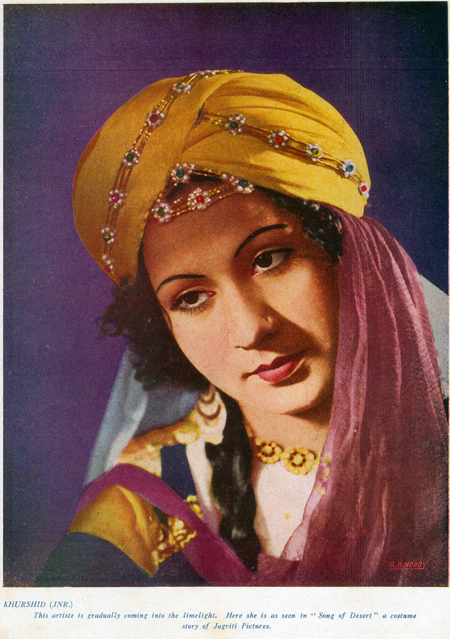 Please post photos and infos of Zubeida (of Alam Ara), Rajkumari (not singer but actress esp as Chandramukhi in Devdas 1936), Rampyari, Sultana (Zubeida’s sister), Fatima Begum (Zubeida’s mom), Azuri (dancer), and many other silent movie stars. Did Dulari ever play a heroine? Chand Usmani had ‘Baap Re Baap’ and ‘Jeevan Jyothi’ before her relegation to bhabhi and Ma roles. We need to preserve these golden age gems for the future generations !! I still remember a film critic from Filmfare (one Mr Singh – I should rush back to my mag closet now!) who rarely gave anything above the “Poor” rating for any movie.Baburao was the same & how wrong he was about his comment about Dilip Kumar on his first movie, whereas Dilip turned out to be a major star & beacon of the industry.Those people were just negative & stupid on everything – how pathetic! “It’s a search that met with a tragic end. When TOI set out to look for yesteryear actress Dulari, based on the information that the Cine & TV Artistes Association (CINTAA) had been lending her financial help, little did we know that she was no more. Dulari, we were told, passed away in January this year at an old-age home in Pune. can you please confirm whether the khursheed jr seen here is Meena kumari’s elder sister?